There are many health benefits associated with cherries. The most well-known type of tart cherry is the Montmorency cherry—it’s the kind you get on top of your sundae or inside a cherry pie. But as delicious as cherries are, you don’t necessarily have to gorge on an entire bag to reap the benefits; you can gain them by drinking tart cherry juice, too. Tart cherry juice is made from the fruit of the Prunus cerasus tree, which is native to southwest Asia and Europe. The fruit is also called sour cherries or dwarf cherries. There are several varieties of tart cherry, including the light-red amarelle cherry or the dark-red morello cherry. Why is tart cherry juice such a healthy beverage? First of all, tart cherries are loaded with nutrition. In particular, they contain various antioxidant and anti-inflammatory properties, which include vitamin A, vitamin C, vitamin E, and zinc. One cup contains 40% of the recommended intake of vitamin A, and 26% of the recommended vitamin C. Other nutrients within tart cherries include fiber, protein, omega-3 and omega-6 fatty acids, vitamin K, folate, choline, vitamins B2, B3, B5 and B6, calcium, iron, magnesium, phosphorus, copper, and manganese. They also contain trace amounts of vitamin B1 and sodium. A better-known benefit of tart cherry juice is its ability to fight inflammation and arthritic pain with its antioxidant and anti-inflammatory properties. Some of these nutrients include vitamin A, vitamin C, quercetin, cyanidin, and anthocyanin. There is also research to support the benefits of tart cherry juice for arthritis. In a study published in the Scandinavian Journal of Rheumatology in 2006, researchers confirmed that the anthocyanin in tart cherries can relieve the inflammation linked with arthritis. And in a study published in the Journal of Food Studies in 2012, researchers found that drinking tart cherry juice twice daily for three weeks reduced pain in patients with osteoarthritis. Blood tests also showed significantly less inflammation. Non-steroidal anti-inflammatory drugs (NSAIDs) are often the go-to drugs to treat swelling. That said, NSAIDs themselves may lead to swelling in the legs and arms due to kidney-related fluid retention. This can lead to serious side effects such as kidney failure, bleeding, ulcers, and sometimes liver failure. In a study published in the journal Behavioural Brain Research in 2004, tart cherry juice supplementation was found to decrease inflammation and pain behavior in rats. The anti-pain effect in the study is thought to be due to the antioxidant properties of anthocyanins. It’s possible that tart cherry juice might also reduce swelling in humans. Tart cherry juice has also been found to reduce uric acid levels. High concentrations of uric acid are known to cause gout attacks, which result in intense swelling and pain. 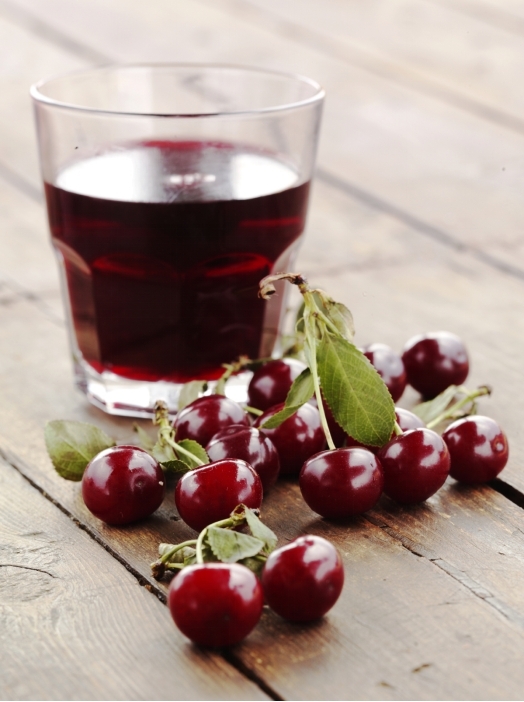 Cherry juice also reduces a biomarker of inflammation called c-reactive protein. According to a 2014 study published in the Journal of Functional Foods, Montmorency tart cherry juice concentrate was found to reduce inflammation and uric acid. Another study from 2013 found that cherry intake was linked with a 35% lower risk of gout attacks in 633 individuals. The antioxidant and antiviral effects from tart cherries are known to help boost immunity. The flavonoids in tart cherry juice in particular are known to fight infection, according to a study published in the journal Biochemical Pharmacology in 1992. Tart cherries are also thought to influence metabolism, which assists the body in losing abdominal fat. One 2010 study published in the Journal of Agricultural and Food Chemistry supports the role of anthocyanins in the reduction of weight. Another study from 2009 and published in the Journal of Medicinal Food found that regular tart cherry consumption can decrease abdominal fat and inflammation, while also reducing the risk of metabolic syndrome, type 2 diabetes, and heart disease. Tart cherry juice is loaded with cancer-fighting chemicals, including ellagic acid, limonene, perillyl alcohol, and anthocyanins. These chemicals are particularly useful against skin, lung, liver, and breast cancers. In an animal study published in the journal Cancer Letters in 2003, researchers found that the anthocyanins and cyanidin in tart cherries may decrease the risk of colon cancer. They also found that anthocyanins and cyanidin reduced the growth of human colon cancer cells. The following is a detailed synopsis of the anti-inflammatory properties of tart cherry juice. These flavonoids are responsible for deep red color of cherries, and are known to deliver potent anti-inflammatory and antioxidant activity. Anthocyanins also have a history of treating cancer, weight issues, swelling, hypertension, liver dysfunction, vision problems, and digestive disorders. Research has demonstrated that anthocyanins from tart cherries significantly reduces inflammation-induced pain in rats. Tart cherries also contain a higher amount of phenolics than sweet cherries, including natural polyphenols and phenol. Phenolics have a potential protective role against oxidative diseases such as cancer, stroke, and coronary heart disease. Studies have also shown the protective effects of phenolics against Alzheimer’s disease. Tart cherry juice also contains a powerful antioxidant, quercetin. In a study published in the European Review for Medical and Pharmacological Science in 2013, quercetin was found to be responsible for preventing oxidative damage due to LDL (“bad”) cholesterol. Other studies show that quercetin improves inflammatory biomarkers in women with type 2 diabetes. Studies have also found that tart cherry juice benefits superoxide dismutase and glutathione peroxidase, both of which are natural antioxidants in the body. A study published in the journal Plant Foods for Human Nutrition in 2009 showed that the antioxidant activity of sour cherry juice increases superoxide dismutase and glutathione peroxidase activity, and lowers lipid peroxidation concentration. Other studies support particular tart cherry juice health benefits; it can help in managing sleep patterns and in mitigating muscle pain and damage. It’s also considered an effective sports or post-workout recovery drink. This juice can be a valuable component to your daily routine. Let’s explore some of these benefits in a little more detail. Long-distance running can lead to muscle pain and potential muscle damage. A study published in the Journal of the International Society of Sports Medicine in 2010 found that ingesting tart cherry juice for seven days before and during a strenuous running event minimized muscle pain after the run. Another study published in the British Journal of Sports Medicine in 2006 found that tart cherry juice is effective in decreasing symptoms related to muscle damage from exercise. 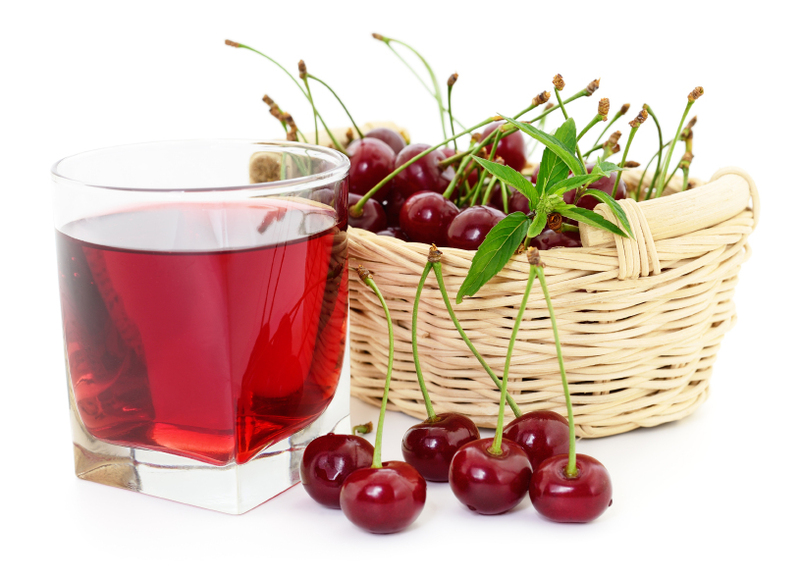 For example, the strength loss after drinking cherry juice was only 4% compared to 22% for the placebo. Tart cherry juice is also very helpful in the recovery after a marathon, according to the Scandinavian Journal of Medicine & Science in Sports in 2010. The juice provided viable recovery after a marathon by increasing total antioxidant capacity and decreasing inflammation, which in turn helps the muscles recover. Tart cherry juice also contains potassium, which helps with hydration and muscle recovery. Sleep is important at any age, and tart cherry juice has sleep benefits. Tart cherry juice is rich in melatonin (a sleep-regulating phytochemical) and has been found to improve sleep in older adults with insomnia, according to a study published in the Journal of Medicinal Food in 2010. The results suggested that tart cherry juice has an effect similar to insomnia supplements such as valerian. Another study published in the European Journal of Nutrition in 2012 suggests that tart cherry juice concentrate consumption increases melatonin levels, which improves sleep duration and quality, and can therefore manage disturbed sleep. or drink eight ounces of tart cherry juice. How Much Tart Cherry Juice Should I Drink? You can have it as two tablespoons of tart cherry juice concentrate, which can be diluted in water or consumed as a shot. You can simply drink eight ounces of tart cherry juice. As mentioned, tart cherry juice is excellent for muscle pain linked with intense exercise, and therefore this beverage can be perfect for a high-level athlete. Both drinking options above can be consumed twice daily for at least seven days before a marathon or big sports event, which will help reduce pain and improve recovery time after the event. This is also known as the seven-day tart cherry juice challenge. All ingredients should be organic to avoid pesticide exposure. Place all the ingredients in a low-speed juicer. Blend all the ingredients until mixed well. Add a few drops of colloidal silver for some extra medicinal properties. Mix all the ingredients in the blender until smooth. Diarrhea and abdominal pain are possible due to the high sorbitol content. The quercetin in tart cherry juice may also increase bleeding when taken with anticoagulant drugs. Limit intake to four ounces daily when trying to lose weight. One eight-ounce serving of tart cherry juice contains 140 calories and can contribute to weight gain. Tart cherry juice is loaded with antioxidant and anti-inflammatory properties, including vitamin A, vitamin C, vitamin E, zinc, quercetin, phenolics, and special flavonoids called anthocyanins. It has many noticeable health benefits and is especially good for arthritis and for reducing inflammation and swelling. 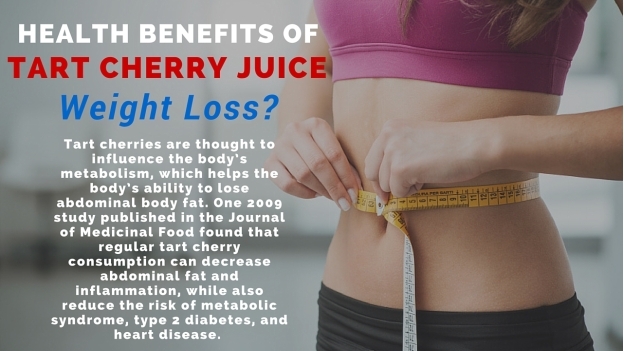 Tart cherry juice can also improve your lifestyle, improving sleep quality and exercise recovery. It makes for a great sports recovery drink. “Nutrition Facts: Cherries, Sour, Red, Raw,” Self Nutrition Data web site; http://nutritiondata.self.com/facts/fruits-and-fruit-juices/1861/2, last accessed April 25, 2016. Kuehl, K.S., et al, “Efficacy of Tart Cherry Juice to Reduce Inflammation Biomarkers among Women with Inflammatory Osteoarthritis (OA),” Journal of Food Studies, 2012; http://www.macrothink.org/journal/index.php/jfs/article/view/1927/1790. Tall, J.M., et al, “Tart Cherry Anthocyanins Suppress Inflammation-Induced Pain Behavior in Rat,” Behavioural Pain Research, 2004; doi:10.1016/j.bbr.2003.11.011. Bell, P.G., et al, “Montmorency Tart Cherry (Prunus cerasus L.) Concentrate Lowers Uric Acid, Independent Of Plasma Cyaniding-3-O-Glucosiderutinoside,” Journal of Functional Foods, 2014; doi:10.1016/j.jff.2014.09.004. Zhang, Y., et al, “Cherry Consumption and the Risk of Recurrent Gout Attacks,” Arthritis and Rheumatology, 2013; doi:10.1002/art.34677. Middleton, E., Jr., et al, “Effects of Flavonoids on Immune and Inflammatory Cell Functions,” Biochemical Pharmacology, 1992; doi:10.1016/j.bcp.2015.06.013. Seymour, E.M., et al, “Regular Tart Cherry Intake Alters Adiposity, Adipose Gene Transcription, and Inflammation in Obesity-Prone Rats Fed a High-Fat Diet,” Journal of Medicinal Food, 2009; doi:10.1089/jmf.2008.0270. Prior, R.L., et al, “Purified Blueberry Anthocyanins and Blueberry Juice Alter Development of Obesity in Mice Fed an Obesogenic High-Fat Diet,” Journal of Agricultural and Food Chemistry, 2010; doi:10.1021/jf902852d. Kang, S.Y., et al, “Tart Cherry Anthocyanins Inhibit Tumor Development in Apc(Min) Mice and Reduce Proliferation of Human Colon Cancer Cells,” Cancer Letters, 2003; doi:10.1016/S0304-3940(02)00583-9. Saric, A., et al, “Improved Antioxidant and Anti-Inflammatory Potential in Mice Consuming Sour Cherry Juice (Prunus Cerasus cv. Maraska,” Plant Foods for Human Nutrition, 2009; doi:10.1007/s11130-009-0135-y. Kuehl, K.S., et al, “Efficacy of Tart Cherry Juice in Reducing Muscle Pain During Running: A Randomized Controlled Trial,” Journal of the International Society of Sports Medicine, 2010; doi:10.1186/1550-2783-7-17. Connolly, D.A., et al, “Efficacy of a Tart Cherry Juice Blend in Preventing the Symptoms of Muscle Damage,” British Journal of Sports Medicine, 2006; doi:10.1136/bjsm.2005.025429. Howatson, G., et al, “Influence of Tart Cherry Juice on Indices of Recovery Following Marathon Running,” Scandinavian Journal of Medicine & Science in Sports, 2010; doi:10.1111/j.1600-0838.2009.01005.x. Howatson, G., et al, “Effect of Tart Cherry Juice (Prunus cerasus) on Melatonin Levels and Enhanced Sleep Quality,” European Journal of Nutrition, 2012; doi:10.1007/s00394-011-0263-7. Pigeon, W.R., et al, “Effects of a Tart Cherry Juice Beverage on the Sleep of Older Adults with Insomnia: A Pilot Study,” Journal of Medicinal Food, 2010; doi:10.1089/jmf.2009.0096. Ushedo, S., “3 Reasons You Need to Eat Tart Cherries + Smoothie Recipe,” The Naked Label website, January 19, 2014; http://thenakedlabel.com/blog/2014/01/19/3-reasons-you-need-to-eat-tart-cherries/, last accessed April 25, 2016. Andrews, J.D., “Nutrition on Speed: 5 Essential Juice Recipes for Fit Guys,” Men’s Fitness web site; http://www.mensfitness.com/nutrition/what-to-drink/juice-recipes-for-fit-guys/slide/4, last accessed April 25, 2016. Turcotte, M., “5 Promising Health Benefits of Tart Cherry Juice,” Livestrong web site, last updated March 18, 2016; http://www.livestrong.com/article/24160-health-benefits-tart-cherry-juice/, last accessed April 25, 2016. Long Carrera, A., “The Side Effects of Tart Cherry Juice,” Livestrong web site, last updated September 21, 2015; http://www.livestrong.com/article/506277-the-side-effects-of-tart-cherry-juice/, last accessed April 25, 2016. “The 7-day Tart Cherry Juice Challenge,” Montmorency Tart Cherries web site, June 20, 2014; http://www.choosecherries.com/tart-tale/7-day-tart-cherry-juice-challenge/, last accessed April 25, 2016. Downey, M., “Anti-Inflammatory Properties of Tart Cherry,” Life Extension web site, June 2013; http://www.lifeextension.com/magazine/2013/6/anti-inflammatory-properties-of-tart-cherry/page-01, last accessed April 25, 2016. Stevens, C.J., “7 Ways Cherry Juice Benefits You,” Healthline web site, April 22, 2015; http://www.healthline.com/health/food-nutrition/ways-cherry-juice-benefits-you#2, last accessed April 25, 2016. Praderio, C., “3 Unbelievable Benefits of Tart Cherry,” Prevention web site, October 17, 2014; http://www.prevention.com/food/food-remedies/cure-pain-and-insomnia-naturally-tart-cherries, last accessed April 25, 2016.